2. 50/50 Rule: The engagement on your Facebook is the first step to having a successful Facebook page. Include humorous posts, images (memes/ecards), and be sure to listen to your fans. Ask questions and allow your fans to give back feedback. Even though this is your business page it’s not all about you or your business, it’s about your fans and customers, so listen. A good rule to follow would be the 50/50 rule. Make sure 50% of the posts are about your business, and the other 50% are about your fans. To help you create great engagement we recommend creating a content plan. 3. A goal without a plan is just a wish: Creating a content plan will help you stay organized, but will also help you create great content, with end results being great engagement. In your content plan be sure to plan ahead a few weeks and include any events or sales your business has to offer. Remember to make your content plan diverse, no one wants to see the same boring posts week after week. Keeping your fans up to date with industry news and information will also add variety to your page. While creating this content plan, be sure to have a goal in mind (besides converting fans into customers). Know your Facebook analytics, and know how to check most popular posts, highest click through rates, and the reach of each post. This will allow you to see what posts are engaging and which aren’t. Keep this in mind when creating your next content plan. 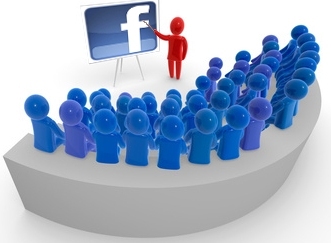 Now that your fans are real and they are engaging with your Facebook page, how do you convert them to paying customers? 1. Links. It’s crucial to have your business’s website visible on your Facebook business page, but it is also just as important to link relevant posts back to your website. Post offers and resources that link back to your website that your fans couldn’t resist clicking on. You can do this by creating a strong call to action (CTA). CTA’s can be placed in both organic and paid Facebook posts by inserting your offer button and linking to the related landing page. Your goal is to bring your fans to your website and keep them there. 2. Now that we brought them to your website, it’s crucial that your Facebook post is relevant to the page they land on. Make sure your Facebook post is consistent with the website landing page you are directing them to. Don’t mislead them, or it is unlikely they will click on future posts. Do not make your website visitors hunt for what they are looking for. Now that we have brought your fans to a relevant landing page, it is up to your landing page to convert the Facebook fan into a customer! Stay tuned to our blog to learn how to create a compelling landing page! And remember, you can’t build a strong Facebook following overnight. Creating a successful business page takes time and patience.